Oryxes are most easily recognized by their prominent horns, which range in length from 480-700 mm. There is little difference in size of the horns of males vs. females. The long, fairly straight horns are basically in line with the straight facial profile, but curve backward slightly. They are annulated, meaning that the horns possess a series of raised rings wrapping around them in the lower two-thirds. 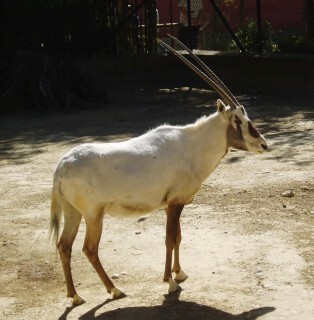 The body of the oryx is white with chocolate markings on the head, neck, limb, and tail tip. 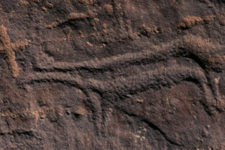 The tail is medium in length with a tassel at the end. Both sexes have a well-developed hump at the withers. The oryx is exceedingly well adapted to desert regions. It can survive for months without drinking any water, obtaining all its moisture from dew and the succulent plants it consumes. It will drink water when it is available, but does not require it. The Arabian Oryx mainly eats grass, with the addition of a large variety of vegetation, such as trees, buds, herbs, fruit and roots. Even though the Arabian Oryx can go several weeks without water, herds can be seen following rains, for the water and fresh vegetation. The Arabian Oryx was formerly distributed all across the Arabian desert. 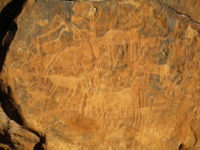 In the first half of the 20th century, a population existed in the Nafud and around Jauf, Taima, and Tabuk. It was also known in Dahana, the narrow strip between the Nafud and Rub’ al-Khali, where it fared better due to the isolation. 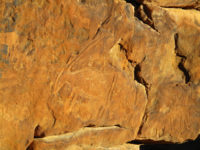 It was also spotted near Najran. Originally the Arabian Oryx was hunted for its meat and hide. But the heavy demand of sport hunting, and availability of firearms eventually wiped out the oryx population. 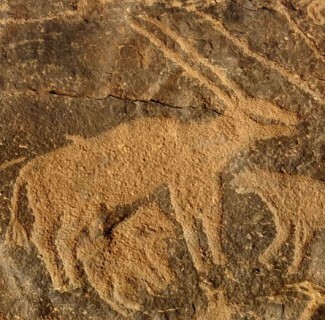 The last recorded Arabian Oryx was shot in 1972. Oryxes were re-introduced in Oman in the 1990’s, but once again, poaching and sport hunting has threatened the species.